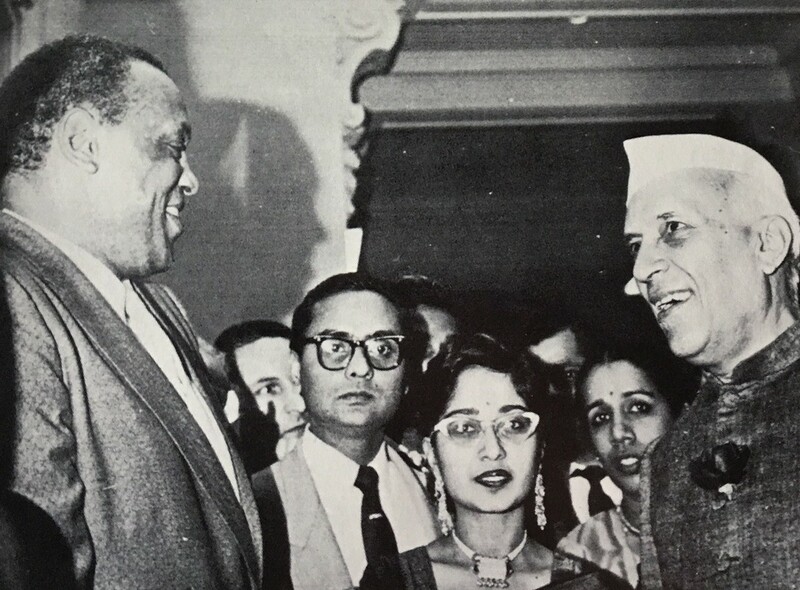 Paul Robeson in New York with Indian Prime Minister Jawaharlal Nehru, 1957. M.B. Duberman, Paul Robeson. In this earlier post, Su Lin Lewis shows how increased access to air travel did not just facilitate the Afro-Asian conferences of the 1950s. It also shaped the composition and location of such meetings and, as a consequence, the connections and relationships that were built there. When it comes to Bandung, travel to and from the conference is both under- and overestimated. In terms of observers, journalists, activists, and even family members, Bandung hosted a greater number of illustrious names than accounts from inside the Gedung Merdeka can ever hope to show. On the flip side, historians also like placing politicians in Bandung who were never really there. Paul Robeson should be counted among those who “should have been at Bandung”. Not because they were officially invited — that privilege was accorded to state representatives alone — but because they wanted to be part of the conference’s orbit. 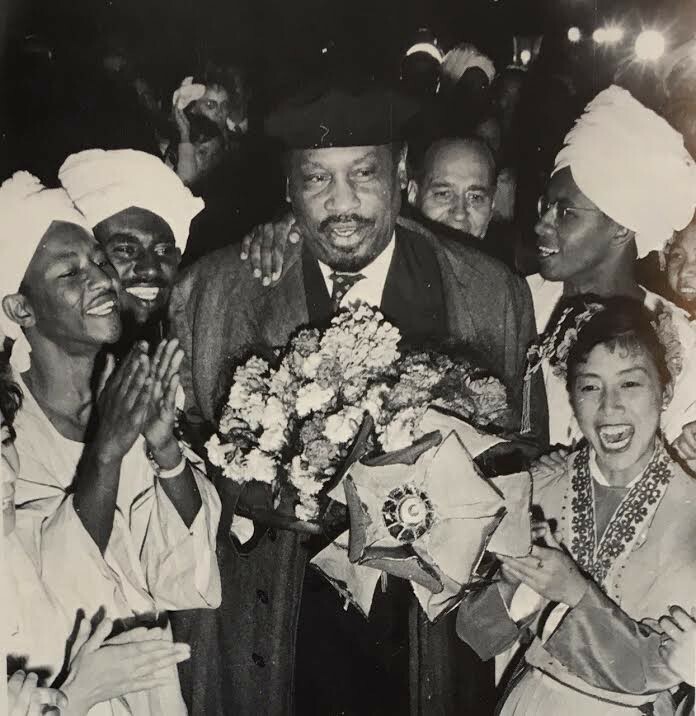 Despite his status as a key African-American ally of the Afro-Asian movement (as well as a much-loved performer), Robeson’s presence at Bandung was limited to a message of solidarity with “the power and the determination of the peoples of these two great continents”. In 1950, Paul Robeson’s ability to travel outside of the continental United States had been taken away by a “stop notice” from the State Department. As Martin Bauml Duberman shows in his biography of Robeson, this decision can be understood in a Cold War context, but was rationalized explicitly as an attempt to curb his popularity in the decolonizing world, and the criticism of the United States he voiced there. It is partly because of his strong connections to the international anti-imperialist movement, that Robeson’s travel ban did nothing to curb his popularity. On the contrary, it focused the attention of the decolonizing world on him. As Gerald Horne has argued, segregation and racial politics more generally were the ‘achilles heel’ of the cultural Cold War, and diminished the power of US propaganda across Afro-Asia. African-American leftists with anti-racist and anti-imperialist agendas were prosecuted with particular severity. This had been the case for W.E.B. DuBois, Claudia Jones, Shirley Graham, and it was certainly the case for Paul Robeson. But if anti-communism hampered the activities of African-American activists, it also cemented the very linkages it sought to break. Just as Robeson’s rousing message to the Bandung Conference hindered his case — it was presented as evidence in the August 1955 hearing that turned down his appeal — his separation from his passport became itself a rallying point of Afro-Asian solidarity. World Peace Council Bulletin, August 1954. This was particularly pronounced in India. The All-India Peace Council issued an appeal to leading figures in the world of Indian literature and art and to cultural organisations. The US Embassy in New Delhi became a site of protests and letter campaigns. A public meeting in August 1954 further strengthened the campaign. It is not surprising that the All-India Peace Council coordinated these efforts: the Council felt a particular kinship to Robeson, who approached the peace movement from the same anti-imperialist perspective, and frequently reminded the World Peace Council that full decolonisation was an absolute prerequisite for lasting peace. Robeson’s Bandung message, too, had read that “peace in Asia is directly linked with the problems of freedom and full sovereign rights for the nations of Asia”. 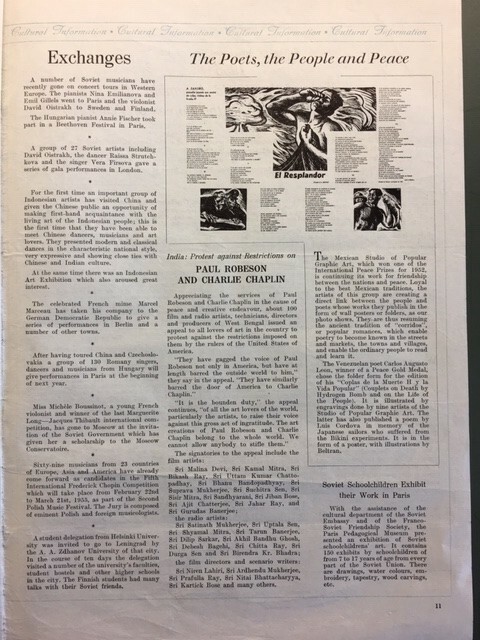 In response to the solidarity Robeson had received, the Othello Recording Company declared that they would attempt to satisfy the enormous international demand for Robeson’s music by recording extra songs from the countries from which the requests had come. These new songs would be specially recorded by Robeson for the occasion “as far as possible, in the national language”. As Gerald Horne highlights, Robeson was famously polyglot, having studied languages ranging from Gaelic to Mandarin and Ashanti. World Peace Council Bulletin, January 1955. 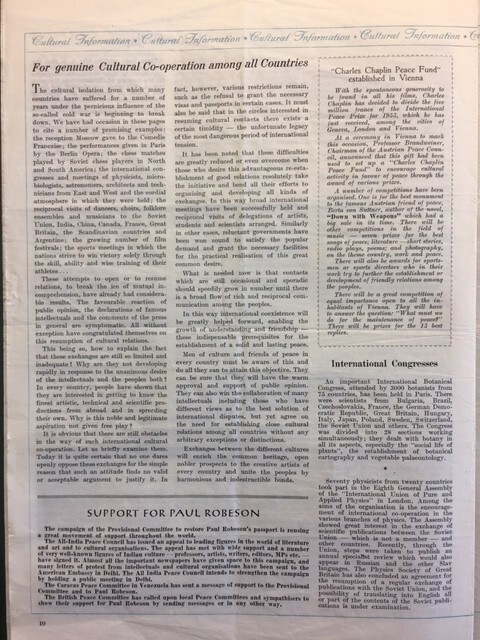 Just ahead of the Bandung conference in January 1955, moreover, dozens of media figures in West Bengal issued an appeal to “all lovers of art in the country” to protest the travel ban on Robeson as well as his decreasing air time in the United States itself, saying “they have gagged the voice of Paul Robeson not only in America, but have at length barred the outside world to him.” It is no wonder that Robeson continued to highlight the Bandung moment in his speeches and writings in the late 1950s. To the World Peace Council, of which the All-India Peace Council was part, he noted that “peace-lovers dare not relax”, but that Bandung had proven that countries with widely differing political systems “can unite upon a policy of living in peace”. With African and Asian students at the World Youth Festival in Vienna. M.B. Duberman, Paul Robeson. In April 1958, Nehru himself called for a widespread celebration of Robeson’s sixtieth birthday. Chief Justice M.C. Chagla headed an All-India Paul Robeson Celebration Committee. As Vijay Prashad has shown, there was considerable pushback from the US Embassy, despite their previous experiences of the strong Indian solidarity towards Robeson. However, 1958 was also the year Robeson’s passport was reinstated, ending an unprecedented eight-year ban that had been, until then, continuously upheld in appeal. Robeson immediately departed on a world tour that included the Afro-Asian Film Festival in Tashkent, and made new plans to visit India. By 1959, he was meeting with African and Asian students at the World Youth Festival in Vienna. The fact remains, however, that Robeson was grounded in the continental United States during the very years that Afro-Asianism was at its most mobile and optimistic. That he was an important presence in the movement during those years nevertheless, is a testament to the strength and resilience of Robeson’s own Afro-Asian network. New Perspectives on Decolonisation, the Cold War, and Asian-African Connections.